Tally Ho, old chap! Click here to play! Have yourself a taste of Britain at this elegant slot, and earn a cash jackpot even the Queen herself would be proud of. 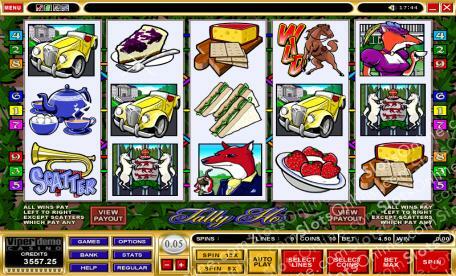 Tally Ho is a fun 5-reel slot that is played across 9 pay lines of sheer British exquisiteness. There are 90 coin slots available, and if you activate more pay lines, you will be privy to higher payouts on winning combinations. On any win at Tally Ho you will be offered the chance to gamble your prize for double the excitement! The Horn is Scattered and will not only payout up to 500 times your wager, but will also earn you 10 free spins when three or more appear on the reels. The Horse is Wild and can be substituted for any other symbol except Scatters. Additionally, any combination that employs the Wild Horse will have its winnings doubled, and if you manage to spin up all five Horses in one play you will be rewarded with up to 6000 times your initial stake. There is plenty of excitement to be had at the Tally Ho slot today, so get on your horse and start playing! The Horn is Scattered and can pay out up to 500 times your bet. If you manage three or more in one spin you will also be rewarded with 10 free spins. The Horse is Wild and will double any winning combination payout when used as a substitute. If you can land all five on active pay lines in a single spin you will win your 6000 times your original bet.